UW 1, OSU 0, 6:31 left/2nd. Buckeyes going on the power play for the first time after a trip. UW's Wagner gets called for a tripping penalty, putting OSU's national-best power play to work. Badgers will send out the PK unit for the first time with 6:31 left in the period as Wagner is called for tripping. BUCKEYES GOAL: Dakota Joshua scores on the power play, and it's 1-1 with 6:12 left in the second. Wagner penalty hurts UW. Buckeyes convert on the power play to tie the game at 1-1 with 6:12 left in the second. OSU's Fidler is called for hooking on a good shift by UW's third line. Badgers to their second power play (0/1) with 3:21 left in 2nd. 1-1. Good shift by UW leads to a power-play opportunity with 3:21 to go in the period. Game is tied 1-1. Nothing to show for the Badgers on the power play. 1:21 left in the second period. END 2: Wisconsin and Ohio State are tied 1-1. Shots on goal were 14-7 for UW in second but OSU got a Joshua PPG. And we're underway in Missouri! This is only the sixth time in 35 games this season UW has gone to the third period tied. Badgers are 3-2 in those situations. Boston College out shooting the #Badgers early 8-1. 13:45 left in the first period. And now Boston College heads on the power play. Jenny Ryan called for slashing. Shot attempts are 45-28 for the #Badgers but UW and Ohio State are tied 1-1 as the third period starts in the B1G semis. UW and OSU back out for the third period tied at 1-1. Badgers lead the SOG category by a count of 22-13. 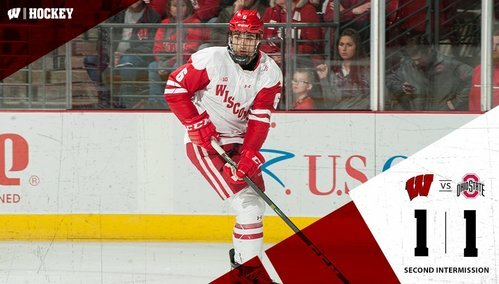 BADGERS GOAL: Will Johnson finishes a nice pass from Seamus Malone, and UW leads OSU 2-1 with 18:30 left in the third. 10th goal of the season for Will Johnson. UW takes a 2-1 lead. 17:30 left/3rd. UW goes on the power play. 5:39 left in the first period. Buckeyes think they have a goal, and ref signals for one, on a Dakota Joshua redirection, but replay shows it hit the crossbar, No goal. Buckeyes tie it at 2-2 with 15:38 to go in the second. No goal! Badgers still lead 2-1 with 15:38 on the clock. Buckeye shot hit off the crossbar. UW still leads 2-1, 15:00 left/3rd. That's two posts hit today by Ohio State, one by Laczynski in first and that one by Joshua. UW leads 2-1 with 13:46 left in the third. Big penalty kill coming for UW after McGuire is called for tripping. Badgers lead Ohio State 2-1 with 13:27 left in the third. Jobst draws a penalty. Buckeyes to the power play down 1. McGuire is given two for tripping and UW will try to kill off a potent OSU power play. 13:27 left in regulation with the Badgers up 2-1. #Badgers called for their second penalty of the period. 1:34 remaining in the first. And now BC is called for a penalty, so we'll have 58 seconds of 4 on 4. Kill! McGuire steps out of the box and we are back to 5-on-5 hockey. Under 12 minutes to go in regulation now. 8:45 left in the third, UW leads OSU 2-1. Buckeyes had a good stretch of pressure there during and after the power play. Lots of pressure on the UW net but Berry and the defense are up to the task. 2-1 Badgers with 8:45 left in the game.